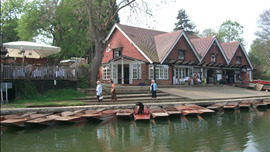 An unassuming Victorian hostelry in a pretty Thames-side village not far from Abingdon, the Fish is famous as an anglers' retreat and has also established itself as a prime destination for good food, drink, and country hospitality. 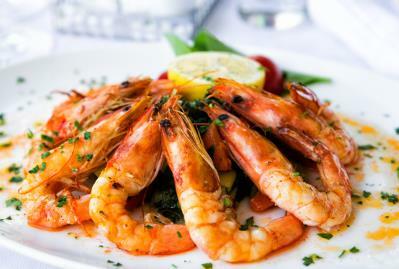 Given the piscatorial name, it's no surprise that seafood has always been one of the pub's specialities. The tradition is alive and well, thanks to the efforts of the resident kitchen team. 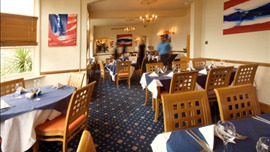 Visitors can enjoy a full complement of enticing dishes including spicy marinated squid salad with tomato and coriander, whole baked dorade with lemon and thyme, and medallions of monkfish with scallops, saffron sauce and lemon rice; there's also cod and chips if you fancy something traditional. Away from the sea, the kitchen offers things like breaded goats' cheese salad with walnuts and plum chutney, slow-cooked oxtail with mash and Gressingham duck breast with five spices and prune sauce. As for desserts, choose something exotic (mango and passion fruit delight with mango sorbet) or something old-fashioned (treacle sponge and custard). The wine list has a good spread of well-chosen bottles ranging from Southwest France all the way to South Australia. "Good food takes time, if you are in a hurry please let us know"
(*) -Tarte fine aux pommes flavoured with calvados and vanilla ice cream. and Crème Chantilly & roasted flaked almonds. - Iced nougat parfait with red fruits coulis. - Meringues with crème Chantilly, pineapple, mango and raspberry sorbet. - Chocolate délice with custard and coffee ice cream. - Banoffee pie with whipped cream, toffee sauce and coconut ice cream. - "Colonel" lemon sorbet and chilled vodka. - Hot treacle sponge with custard and vanilla ice cream. - Lemon cheesecake with raspberry sorbet and coulis. - Profiteroles with vanilla ice cream and chocolate sauce. -A selection of French and English cheeses with biscuits (+£2.00).